My boys. They might not match up to everybody else's expectation of how they should conform. But then again, everybody else doesn't have identical twins. They don't conform like singletons. Their behaviour is special and different, but we bloody love them and after a tough week of trying to explain how identical twins 'tick', to various people, I've had enough. Onwards and upwards. 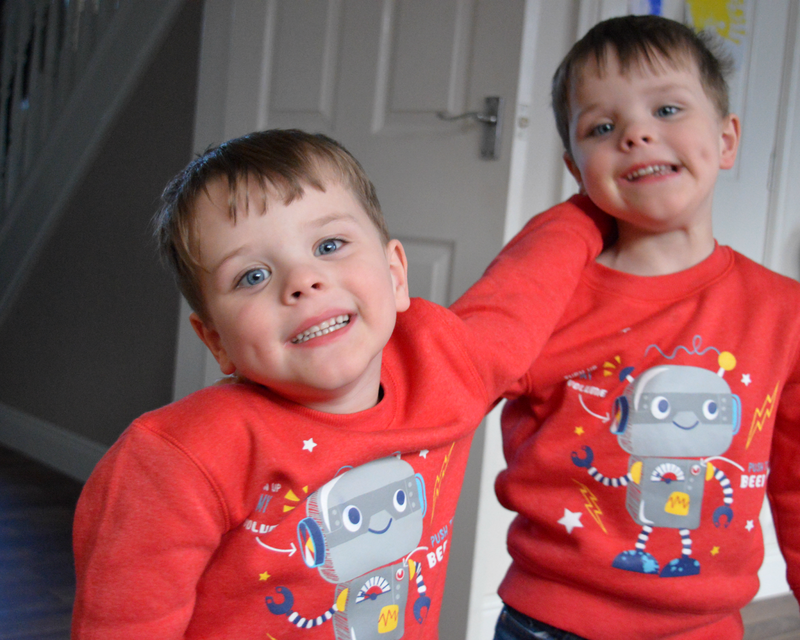 How cute are these red robot jumpers from Asda? Love the boys in red! They are so cheeky and so close too. Little monkeys they are! They look a joy, our triplets are very different in character. Oh my! Triplets! I hope you wear your medal with pride! My two have different characters, but definite twin traits that can be perceived as naughty by those that don't know them. Yes. Such a bargain too. 2 for £6.00. We love George clothing! Thank you. They do tend to spend much of the day like this.